I was attempting to write a paper for my Film & Human Values class but then I noticed my perfume collection, that I never pay much attention to. There sat a tall bottle of J'adore amongst many other shiny bottles filled with golden liquid. The little square bottle of Versace seemed stumpy. 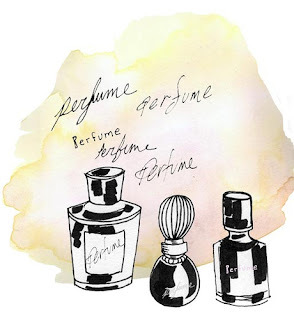 I had not worn Coco Mademoiselle in ages, I wondered why, since it was "my scent," meaning people knew me for wearing it. I was the girl with the square bottle of Chanel perfume on my dresser. Nothing else. I didn't want any other scent to compete with it. People always said, you are lucky when you find that scent that becomes you. I was lucky, but then it started to remind me of my ex. I rarely wear it anymore. Then I thought about the memories scents can evoke. Every time I pick up a bottle of perfume, somehow it reminds me of one of the women in my life. No. 5, a strong scent brings images of my grandmother to mind, draped in her black lace. Burberry London reminds me of hot summer Los Angeles evenings in flowing skirts. Allure by Chanel, fresh and soft, my mother. For some reason all Dolce and Gabbana scents remind me of evening dinners with my aunt. I am on a quest to find my new scent. I'm so glad you're keeping up with this blogging thing! Loved the post.